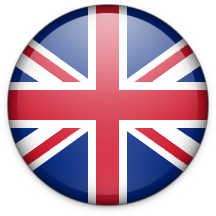 Follow DinghyGo events on . Aquacrafts shows its new sportive DinghyGo Orca, allround Nomad 3 and compact DinghyGo Nomad S models at Interboot from 21 - 29 September 2019 at the Messe Friedrichshafen, stand A1-200. Your host is Aquacrafts. More information Interboot. 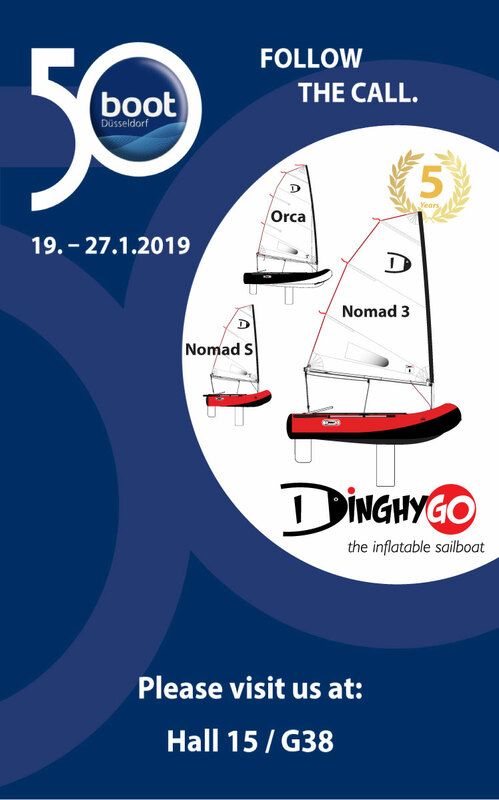 Aquacrafts showed its sportive DinghyGo Orca, allround Nomad 3 and compact DinghyGo Nomad S models at world's largest Boating Show, BOOT 2019 from 19th - 27th January at the Düsseldorf Messe stand 15G38 (hall 15), Germany. 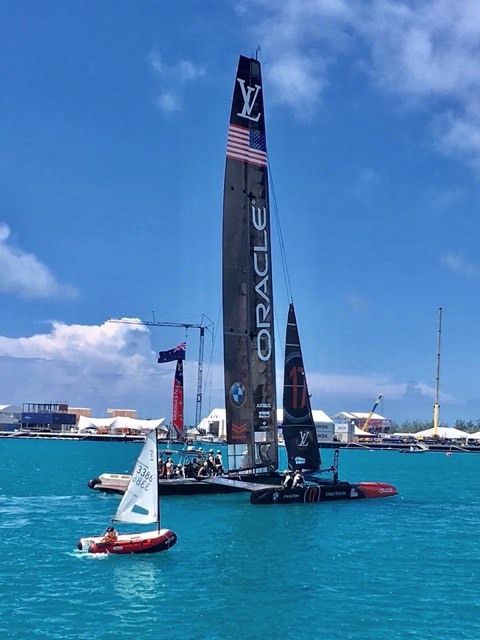 Your host was Aquacrafts in co-operation with Distributor Friesland Watersport. 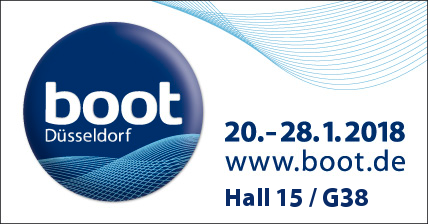 More Information Boot2019. Aquacrafts debuted its new sportive DinghyGo Orca, allround Nomad 3 and compact DinghyGo Nomad S models at Interboot from 22 - 30 September 2018 at the Messe Friedrichshafen, stand A1-200. Your host was Aquacrafts. More information Interboot. DinghyGo demonstrated its latest ultralight 3 Nomad model from September 14th - 23rd at the Southampton Boat Show 2018 in Southampton, UK stand A040. Your friendly host was Nestaway. More information SBS2018. 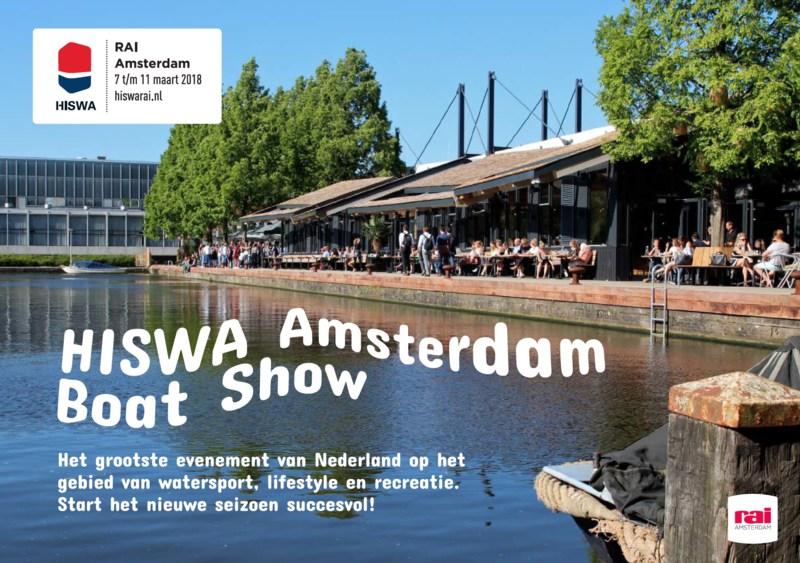 Aquacrafts introduced its new sportive DinghyGo Orca and new compact DinghyGo Nomad S models at the Amsterdam Boat Show HISWA from 7 - 11 March 2018 at the Amsterdam RAI, stand 01.104. 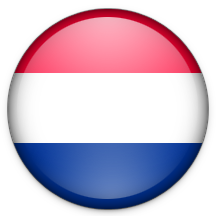 Your host was Aquacrafts in co-operation with Distributor Friesland Watersport. 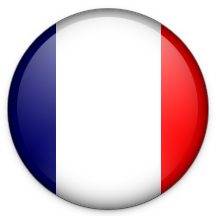 More information Hiswa2018. Aquacrafts introduced its new sportive DinghyGo Orca and new compact DinghyGo Nomad S models at world's largest Boating Show, BOOT 2018 from 20th - 28th January at the Düsseldorf Messe stand 15G38 (hall 15), Germany. 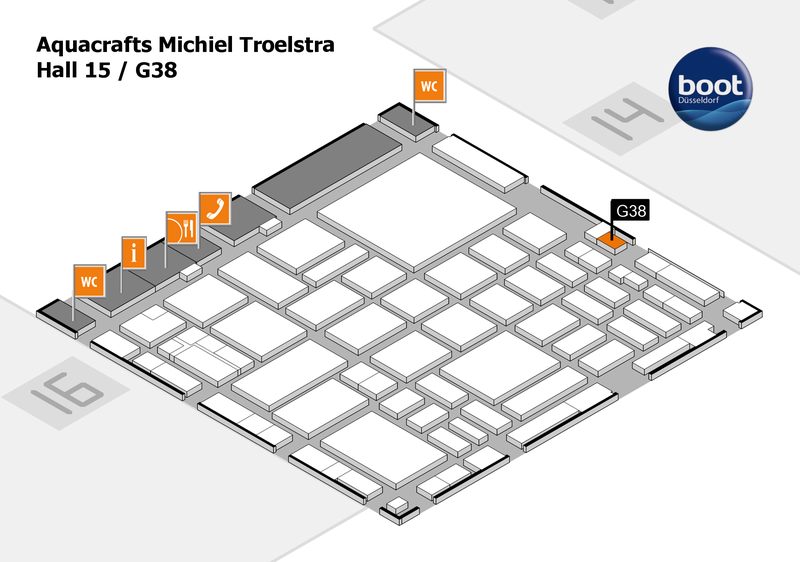 Your host was Aquacrafts in co-operation with Distributor Friesland Watersport. 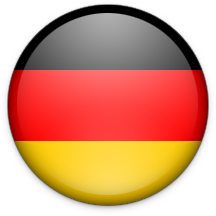 More Information Boot2018. 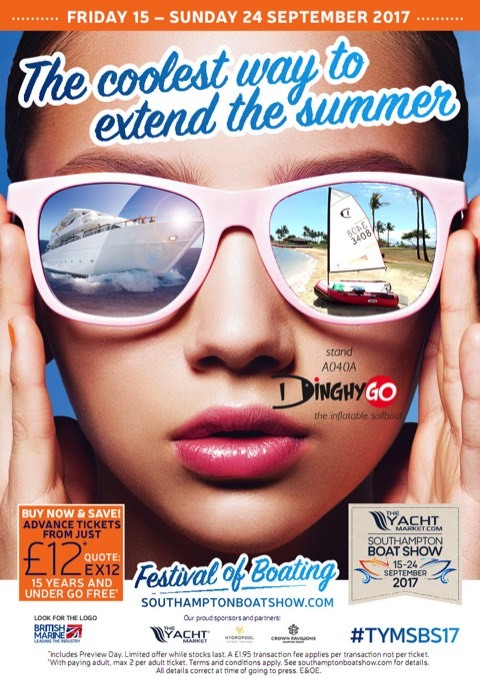 DinghyGo featured again at The London Boat Show, the largest UK Boating Show from 2018 10th - 14th January in London, Engeland. Your host was Nestaway Boats stand number SB006 E-P. More information LBS. DinghyGo introduced its latest ultralight 3 Nomad model from 2017 September 15th - 24th at the Southampton Boat Show 2017 in Southampton, UK stand A040A. Your friendly host was Nestaway. DinghyGo introduced its latest light weight 3 Nomad model at Boot 2017, world’s largest Boating Show from 2017 January, 21st - 29th in the Messe Düsseldorf, stand number 15G38 (hall 15), Germany. Your host was Aquacrafts. DinghyGo introduced its latest light weight 3 Nomad model at The London Boat Show, the largest UK Boating Show from 2017 January, 6th - 15th in London, UK. Host was Nestaway Boats with stand number C038. DinghyGo introduced its light weight composite design 3 Nomad model at the Southampton Boat Show, Britain’s biggest boating festival, from September, 16th - 25th. The stand numbers were A061 and A062 hosted by Nestaway Boats. DinghyGo introduced the 3 Nomad from 2017 February 21st - 26th at the Caravan, Camping & Motorhome Show 2017 in Birmingham NEC, UK stand 2162. 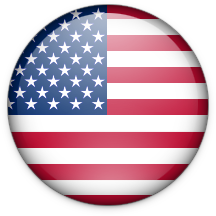 Your host was Nestaway. 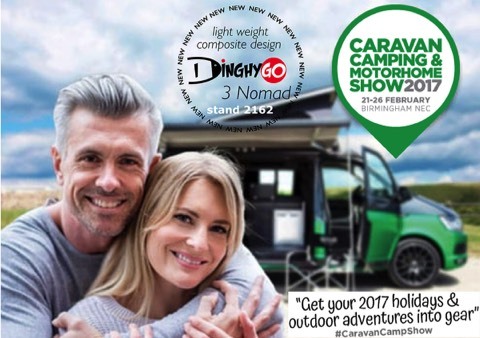 DinghyGo was on show at Caravan, camping & motorhome Show 2016, UK’s leading leisure vehicle showcase, van 23 - 28 February in NEC Birmingham, Engeland. Host was Nestaway Boats. 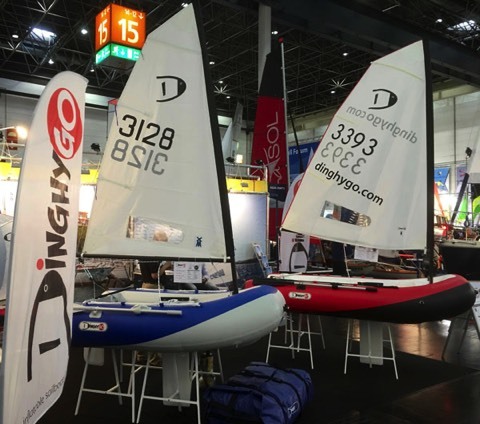 DinghyGo exhibited for the 3rd time at Boot 2016, world’s largest Boating Show from 2016 January, 23rd - 31st in the Messe Düsseldorf, stand number 15D40 (hall 15), Germany. Host was Friesland Watersport. 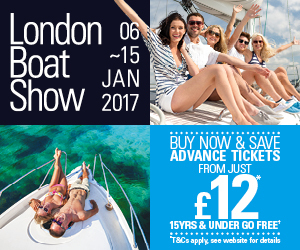 DinghyGo exhibited for the 3rd time at The London Boat Show, the largest UK Boating Show from 2016 January, 6th - 17th in London, UK. Host was Nestaway Boats with stand number A070.